One of LoopBack’s core features is the ability to lock down access to your APIs and define exactly who can do what with your data. LoopBack provides multiple tools to make this easy, but it’s helpful to see a real (although simple) application demonstrating the complete process of securing your APIs. Add support for users to your application. 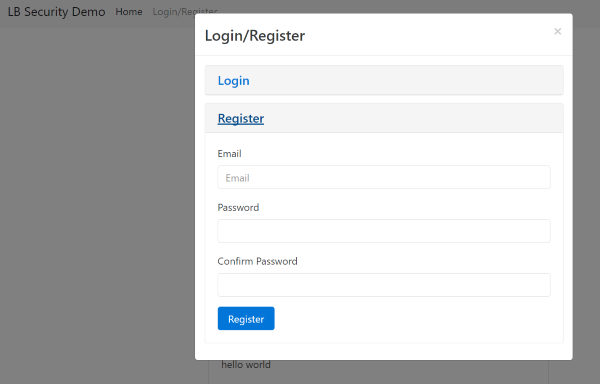 Add user registration and login/logout. Create rules for your API that follow common patterns, for example, only a logged in user can create content and only the owner of content can modify it. You can find the full source code for my application here: https://github.com/cfjedimaster/StrongLoopDemos/tree/master/simpleauthdemo. And that’s it. If you’re curious about the design, I decided to give Bootstrap 4 a spin. Let’s now take a look at the application in-depth. LoopBack’s User model provides all the API calls you need. 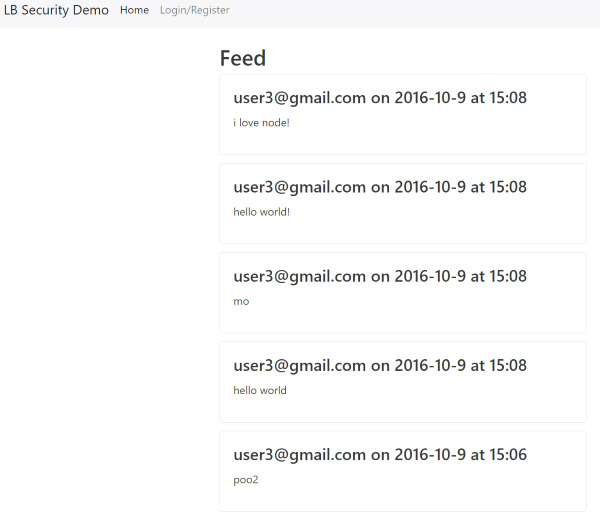 It supports creating a new user, handling login and logout, preventing multiple users with the same username, even email confirmation if you want. You can add your own properties of course, but for the demo I kept appuser pretty simple. So, in approximately two minutes, you’ve got a full user system for your front-end to use. As someone who worked in the web industry for over twenty years, the thought of never building a user system again is really, really freaking nice. A created property that we will set to the current time. An owner who created the post. You’ll notice that created is not required. Why? We don’t want the front-end sending a time since it will be based on the user’s clock and timezone. Even if we converted the time to the server’s timezone, we don’t want to trust the time sent by the user since it isn’t something they should set. You’ll see in a bit how we set that value on the server. If a property is a relation and points to a model that extends a User class. If a property is a number type and is called “userId”. If a property is a number type and is called “owner”. And obviously, for all three, the values would need to point to the current authenticated user. You’ll see how that works later on as well. Our use of rule #1 for the Post model will be sufficient for our purposes. There is an edge case you should be concerned about, however. Imagine a Cat model that has a few properties, like name, age, and gender. Now imagine it has a relational property called boss that points to a User instance. Now imagine it has another relational property called humanIPukeOn that also points to a User instance. In that case, LoopBack will consider both property values when determining if the Cat belongs to the current user. This is a reported bug, but it means if you have multiple properties pointing to a User object (or a model extending User, which is recommended), than you will not be able to correctly identify content belonging to the user. The first and most important rule is to say no one can do anything. That seems a bit crazy, but it makes sense from a security perspective. Instead of telling LoopBack what users aren’t allowed to do, instead we simply block every single action possible. We then gradually open up access to particular features one by one. This ensures we don’t miss anything and provides a “secure by default” format for our API. Next, we say that only logged in users are allowed to create new Post objects. Then we say that only the owner of Posts objects are allowed to edit and delete them. Finally, we allow anyone to read Post objects. This is what an anonymous user will see when they hit the application. You can use the command line to add these ACLs by using slc loopback:acl. The command line will prompt you for what you want to lock down. Here’s an example of locking down everything as we described in step 1. See that ID? That’s your access token that you can use to authenticate further calls. The Explorer makes this simple. At the very top of the screen, copy and paste the token and then hit the nice big green “Set Access Token” button. Now you can try adding a post again. This time it should work correctly. As you can tell by the definition, this hook runs before a create operation. We default created to the current value and ownerId to the current user. Two things to note there. Why ownerId and not creator? Creator is the name of the relationship, but the actual foreign key was ownerId. Secondly, where did we get the userId? 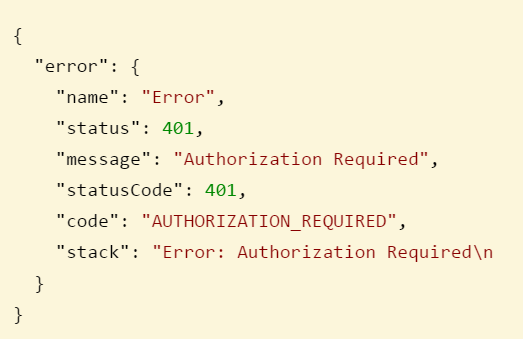 LoopBack places that automatically in the request scope under the accessToken object. It’s a convenience that helps us out here. Now our server-side is complete! The client is—to be fair—not the prettiest thing. But it does demonstrate most of the features you would expect in a real application. We can register, login, create posts, and lists all the current posts. Instead of showing you all the code, let’s break down the important bits of those particular actions, beginning with the public view. loadPosts is called on startup and run in an interval defined by a global variable INTERVAL. LoopBack does support fancier ways of knowing when new data is created, but honestly, this was the simplest and fine for a simple proof of concept. We begin by making a GET request to /api/posts. Note the variables in use. First, we tell the API to include the related user. By default the API won’t to save space in the network call. Then we have a filter on created. We only want new posts on every API call. The variable lastCheck was defaulted to January 1, 2000, so on the first load it will get all the posts. Finally, we tell the API to order by the created value in descending order. Then it’s simply a matter of rendering. We loop over each post and output some basic HTML to render it. Also note the check to see if the post was created by the current user. You’ll see userid set later in the register/login routines. Let’s take a look at register now. <strong>Please correct these errors:</strong><br/>Sorry, but that email already exists. While there’s a lot going on here, a vast majority of it is DOM checking and reporting of errors. That’s not really important. Instead, focus on the post operation. That’s used to do the initial registration. When done, that’s then followed up by a login call. We store both the userid and the token for later user. The login routine is similar, but much smaller since it doesn’t need to register as well. Now let’s look at creating posts. And that’s really it. Most of the code is handling user interactions and reporting/rendering issues. The API calls are relatively simple since LoopBack is handling so much of the work for us. Hopefully this has been helpful. 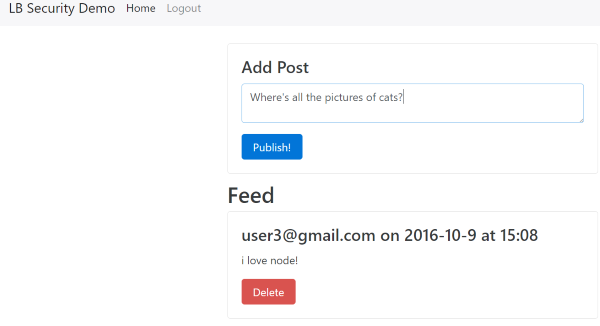 Click here to try out LoopBack, our highly-extensible, open-source Node.js framework.